Stay in luxury at this family friendly resort. Each bedroom is furnished with beautiful furniture, high thread count sheets, and upscale linens. Each bedroom has a private bath, and each bedroom has accommodations for children (i.e. sleeper sofa/chair, day bed). The kitchen has Thermador appliances, granite counter tops, and is fully furnished. There are two ovens. With over 4000 square feet, your entire family can visit without crowding. It is also perfect for your friends, as more than one family can lodge with privacy. The living areas and kitchen are open, with large windows and exciting views. Deep 2 car garage. This home is located on a green ski run, and is truly ski-in, ski-out, with ski storage at the back door and clothing storage inside. Whitefish Mountain Resort is perfect for the advanced skiers and beginners alike. There is even a new Magic Carpet lift for Toddlers and novices! The private hot tub is located steps from the back door, and faces the ski run. In winter, a snow bank shelters the tub from the run. Just up the ski hill (thirty seconds away) from new day lodge with rentals, daycare, lift tickets, ski school, meeting facilities and restaurant. The home is 25 minutes from the Kalispell airport. The majesty of Glacier National Park is only about 30 min. away. The town of Whitefish is home to fine restaurants, quaint shops, and beautiful Whitefish Lake. The Flathead Lake is also about 30 min away. Many recreational activities for both summer and winter. We can recommend ski/snowboard instructors and river raft guides, as well as assist in arranging group or private hikes in Glacier. Please see the links we have on this site. We first visited Whitefish Mountain Resort, then known as The Big Mountain, in 1993, and returned annually. When our kids were two, they started skiing and eventually fell in love with the area. We plan to retire in Whitefish, and visit now as often as our schedules allow. Located near the Day Lodge and chair #6 in a residential neighborhood, the site was perfect for us. We were attracted to the open floor plan, and the fact that it is 2 stories, not multilevel, a rarity on the mountain. We purchased our home in 2006, and with our neighbors, executed an extensive exterior renovation, resulting in our unique property with bark siding. Our neighborhood is home to wonderful families who are now our friends. Our home is large enough to accommodate several families, with each having private bedroom and bathroom space. The living areas are spacious and open, easily welcoming a crowd. The upscale kitchen is fully stocked for the gourmet on the go. views of ski runs from all rear windows. Rear balcony overlooks Home Again ski trail with views to the resort runs. Front balocnies look to the south, with views toward Whitefish and mountains. located just above new day lodge, the location to purchase tickets and lessons. Directly on the run. Thermador dual fuel built in range with gas cooktop. Separate large wall oven. Sugar, flour, paper goods, detergents provided. Usual spices available. large eat-in dining area in kitchen with seating for 8, overlooks ski run. Also have 6 bar stools at granite island for dining. We had two families share the property. The condo is impeccably decorated with a fully stocked kitchen. Each room as well as the living spaces were quite large and accommodated all of us in a wonderful way. 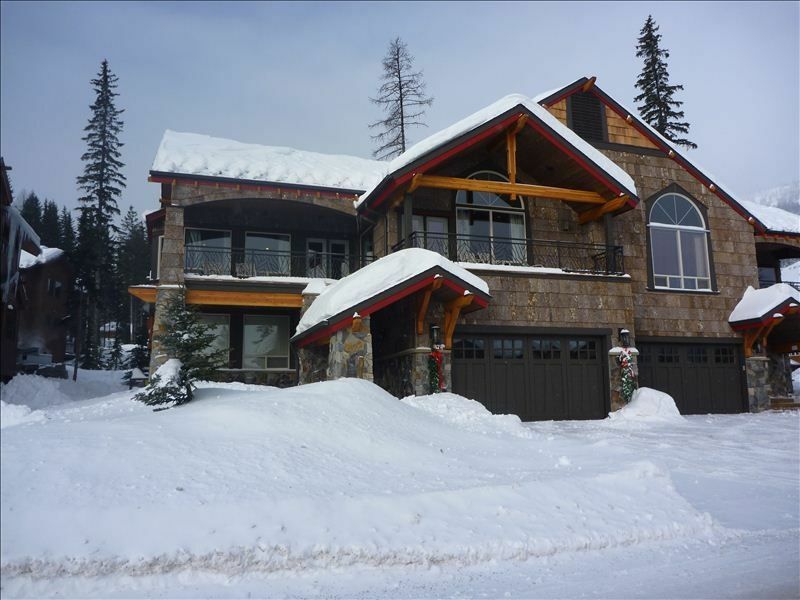 The property is at the base of the ski hill and about 10 minutes from the heart of Whitefish. I would highly recommend the ropes course in the summer time. My husband loved the mountain bike riding on the hill. Would highly recommend. This condo was above and beyond all my expectations! It was much larger than I expected and had so many welcoming touches that I couldn't ask for more. Location was very close to base lodge as well, that we had easy access to all activities. Robin was a great host and was so accommodating. I'm already thinking about another visit! beautiful home. Our family had a wonderful time at this vacation home. What a beautiful home! The pictures posted do not do it justice! We had 8 adults and 2 kids in our group....more than enough room & 'space'. The home was immaculate and very well stocked with kitchen essentials. Robin was very helpful in supplying information about the area, activities and dining suggestions! Any question we had was answered immediately! Robin was by far the best VRBO owner we have worked with over the years! We will definitely be returning! This is our second year staying at the house and we love it. Robin is wonderful to work with and we can't wait for next year. Very Clean, All the Amenities! We stayed here early in 2018 with our family, a group of 11... Lots of beds, lots of room, everything was well -stocked, everyone enjoyed the ski-in ski-out, hot tub and the large kitchen! The included double garage was a very nice bonus. The skiing/snowboarding was awesome, and we thoroughly enjoyed our stay. Thanks a lot for the great time! Zip lines, alpine slide, and walk in the treetops are great summer activities on the mountain, as well as hiking and mountain biking. Golf is a short drive away. Winter sports include skiing, ice skating, snow boarding, snowmobiling, and ice fishing. Cleaning fee of $350.00 due 30 days prior to arrival. 4 night minimum stay during ski season, unless there are available open dates between other guests' stays. Minimum 3 night stay non-ski season. Extended stay rates negotiable. Owners speak with all guests prior to booking reservation.